This morning, after finishing a nice breakfast at our hotel, we walk to the center of the old city at Sarlat, a beehive of activity, enticing aromas, and the bright colors of the Saturday market. 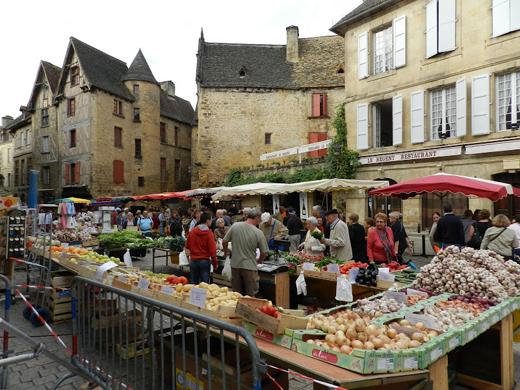 Since Sarlat offers a regional market for this part of the Perigord, scores of farmers display fruit, vegetables, wine, and local specialties such as foie gras, sausages, bread, baked goods, and cheese. Artists, flea market vendors and producers of handmade goods also come to the city to sell their products, attracting hundreds of customers from the surrounding area. Our travelers wander amongst the stalls, and many of them purchase the fixings for a nice picnic lunch to have at Rocamadour, the first destination for the day’s bus ride. In route to Rocamadour the sky suddenly brightens and the temperature rises to provide perfect conditions for our visit of the spectacular medieval pilgrimage sight hewn out of the side of a cliff high above the Alzou, a small tributary of the Dordogne that through the ages has carved out a steep canyon whose walls rise more than 400 feet above the river. After a quick photo stop to allow the travelers an overview of the sight, the bus driver lets us out at the top of the canyon, from which we begin our descent, along a 19th century trail marking the fourteen stages of the cross for a visit of the Chapel of Notre Dame, built into the cliff at the sight of the discovery of Saint Amadour’s body in the 12th century. 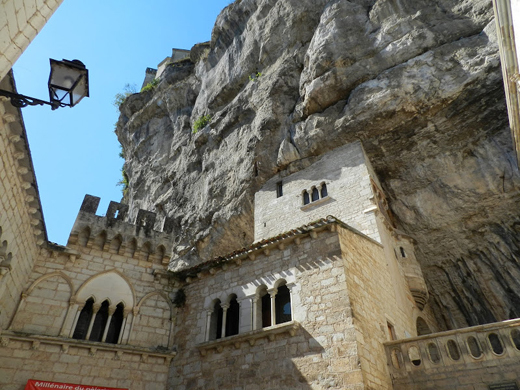 Francoise, our guide and tour leader, explains the significance of Rocamadour as an important pilgrimage sight and points out the wall paintings and the handle of the Sword of Roland which sticks out of the cliff above the entry to the Chapel. 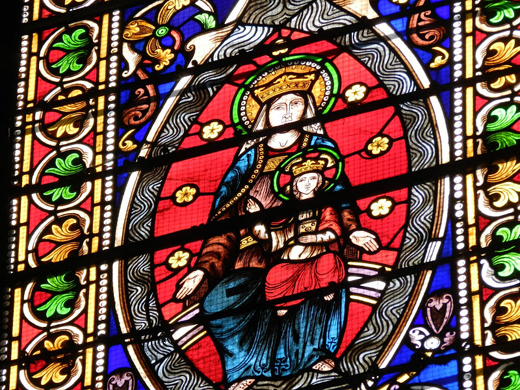 Then we are left on our own to discover the famous Black Virgin of Rocamadour and the beautiful stained glass windows of the Chapel. 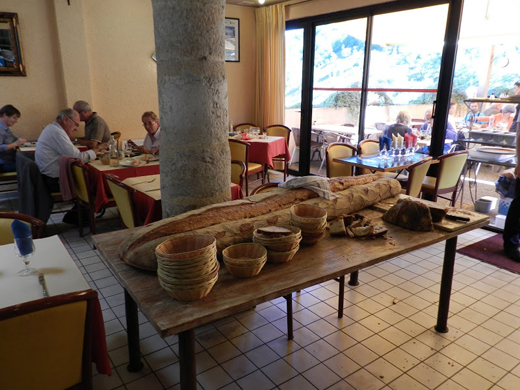 Some of the travelers who did not bring a picnic lunch from Sarlat enjoy a delicious omelet filled with morel mushrooms, served with French fries, a large green salad, and slices of bread from possibly the world’s largest loaf of bread (see photo). Driving back toward the Dordogne valley, we seek out the Dordogne River whose meanderings we follow to one of France’s most beautiful villages, La Rocque Gageac. 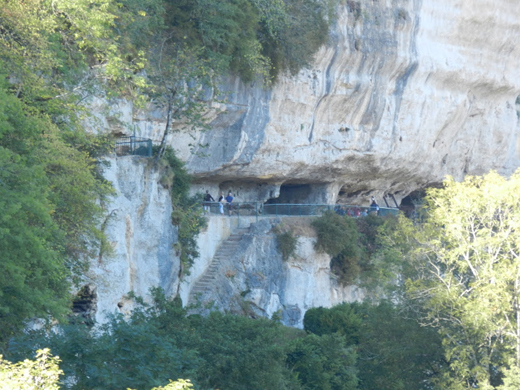 This village was once home to cliff dwellers who built their homes high above the Dordogne, remains of which can still be seen. 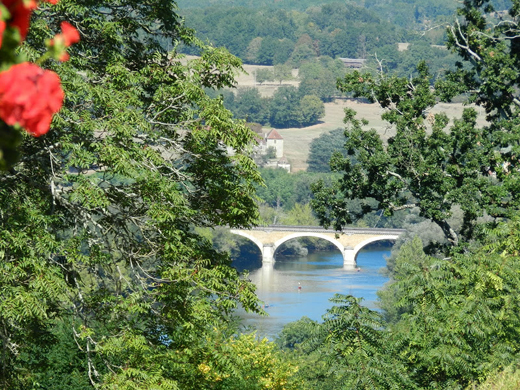 We have a wonderful view of the village that follows the curve of the Dordogne from the shallow-draft gabarre, the traditional boat of the region, which takes us on a lovely and restful river cruise, round-trip from La Rocque Gageac to the Chateau de Castelnaud. 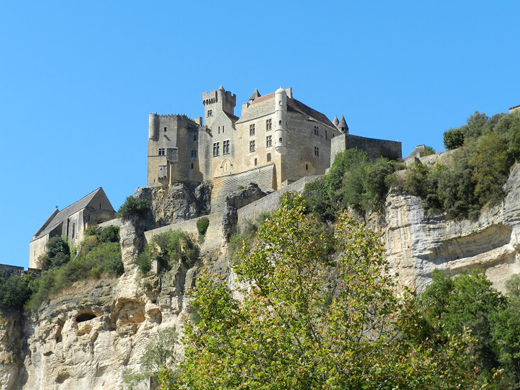 Returning to Sarlat by bus, we have time for another photo stop below the Chateau de Beynac, once ruled over by Eleanor of Aquitaine and her beloved son, Richard the Lionhearted. It has been a full day already, and we return to Sarlat just in time for dinner at Le Regent, an excellent restaurant situated on the central square in front of the Hotel de Ville, where we sample foie gras and confit de canard, served with pommes a la sarladaise, the local potato specialty. Entering the restaurant, the travelers had been astonished by the large crowd gathering in the central square. 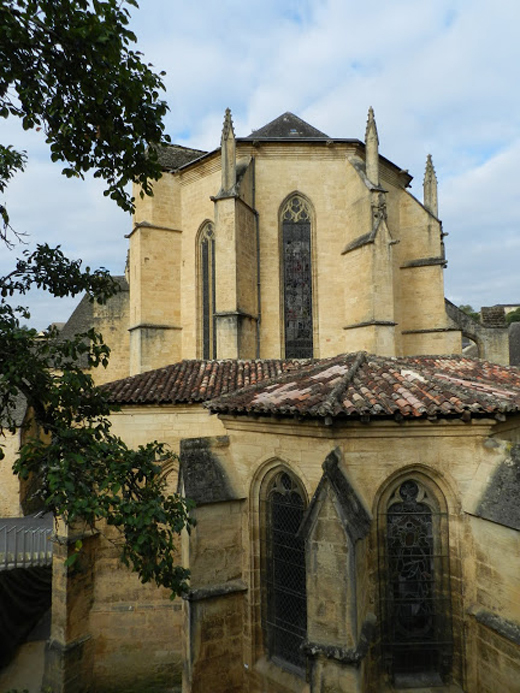 However, they soon discover that this is one of the dates designated for celebration of the French patrimony- a day when many towns open historical landmarks, otherwise not open to the public. The town was beautifully decorated for the evening with candles everywhere, colorful light shows illuminating the walls, story-tellers and actors performed on stage in front of the Hotel de Ville and along narrow streets, women dressed in Renaissance clothing, leaned out their windows to shout insults to one another. The evening was concluded with a harp concert at the local Church. With this wonderful, and completely unanticipated surprise, the travelers made their way back to the Hotel for sleep before an early morning start to their next day’s destination in the Loire Valley. Read more about upcoming departures of our France Through the Ages tour here. John Sweets is Professor Emeritus of History, specializing in the Vichy France era, the French Resistance, and occupied France. He has taught 19th and 20th century European history at the University of Kansas, University College, Dublin (Ireland), The School of International Studies (Fort Bragg, NC), and at the Université de Franche-Comté, Besançon (France).